A shooting incident that occurred on July 11, 2017 in Three Oaks, Florida remains under investigation as a potential road rage incident, according to a report in Southwest Florida’s online news source, News-Press.com. Just before 8:30 p.m., sheriff’s deputies responded to a report of shots fired, with the understanding that the incident was related to a dispute. Neighbors stated they heard as many as nine shots, and that the surrounding area was littered with smashed cars, destroyed mailboxes, and tire tread marks across front yards. Police couldn’t comment further because the matter remains an open investigation, but there may be charges announced if the results reveal criminal activity amounting to road rage assault in Florida. Using or threatening a weapon to cause bodily injury or property damage to the other driver’s car. When you consider these actions in a certain context, road rage may actually be a crime. Assault is the intentional, unlawful threat of violence against another person, such that the victim feels a reasonable fear that bodily harm is imminent. Under certain “aggravating” circumstances, such as where the threat incorporates a deadly weapon, the penalties for a conviction are more severe. Driving aggressively could turn your car into a deadly weapon, which would justify a charge of aggravated assault. In addition, Florida has recently made it a traffic infraction to engage in road rage acts. The statute identifies certain conduct that qualifies as “aggressive careless driving,” such as following too closely, dangerous lane changing, improper passing, and failing to yield. When a driver commits any two of these actions, either simultaneous or in close succession, a police officer may issue a ticket. Penalties include fines, which increase after the first offense. Plus, the violation imposes points on a driver’s record, which can eventually accumulate to include a license suspension. 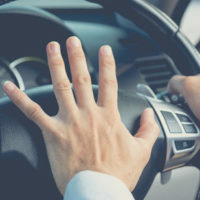 It’s common to become upset and frustrated with other drivers on the road, but your conduct could be a traffic offense – and even a serious felony – under certain circumstances. Road rage is a severe problem across the US, but it’s of particular concern in Florida: The south portion of the state was dubbed as the road rage capital of the country three years in a row. This means authorities will be cracking down on all types of aggressive driving, including situations where actual violence results in harm to victims. If you’re facing criminal charges related to road rage, please contact attorney Kevin J. Kulik. Our attorneys can answer your questions or schedule a confidential consultation in our Fort Lauderdale office.